After 2014 and 2015 editions, INTERNI, – the magazine that for over 60 years has informed the world about Italian creativity – returns to New York, one of the international capitals of creativity and design. “International Design Appointments: the World of Creativity meets Italian Design” is a series of encounters with the leading protagonists of interational design and architecture in some of the most representative flagship stores of Made in Italy. Architects and designer will debate on the theme of new projects for urban landscapes: a new residential model that corresponds to a new way of choosing your own more aware and ecosustainable lifestyle. Sensationalist architecture is being replaced by an approach that pays closer attention to the quality of places and the real necessities of urban subjects: the city returns as the protagonist, a contemporary forum on a large scale, equipped with innovative public and private services. In this Urban 2.0 scenario Italian Design plans an important role to convey an aesthetic and functional language of indispensable value. The encounters, organized at the Italian aperitivo hour or for breakfast, set out to offer interesting moments of discussion and debate on the poetics of particularly pertinent designers and a strategic occasion of connection between flagship stores, design professionals, the magazine and a wider audience. 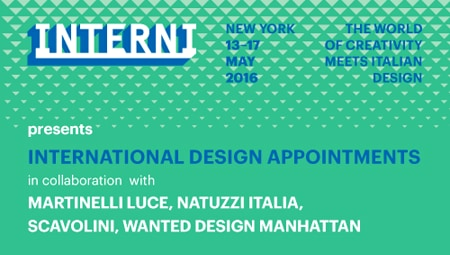 During the third week in May, design showrooms in the creative districts of New York City come alive thanks to Interni, with encounters and talks -International Design Appointments – on the relations between American design and Italian business. During the event in London that celebrates design in September, INTERNI organizes Interni Design Aperitivo exclusive encounters involving major international designers and leading Italian companies. Art and design meet in December in Miami, at one of the most lively events in the field of creativity; Interni Art Design Miami invites architects and designers to narrate and compare their approaches and careers.